Solitaire Dressage represents Alison Kenward's team of competition horses and the riders who train with Alison. Behind the scenes Alison works with a team of professionals to produce results in the competition arena. Alison trains with Emile Faurie, the horses are based at a private yard in Oxfordshire and are looked after by Alison and her Mother, Helen. Alison receives Physio from Phil Pask and the horses are treated by Lee Harris. Farrier is Tim Langley and saddle checking is looked after by RB Equestrian. Alison is supported by Baileys Horse Feeds, Protexin and Equine America to balance the horses diet and additional nutritional support. 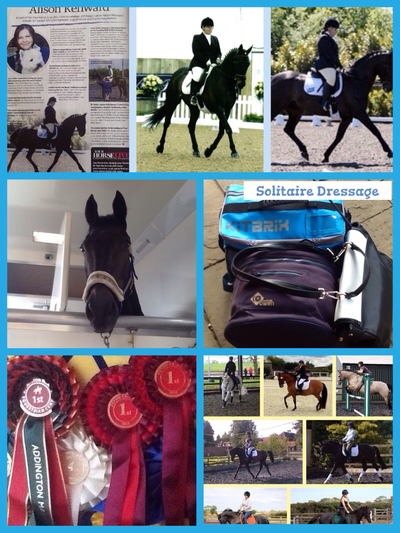 Alison works closely with KitBrix, Caviera & Captured and is preparing for the BD Summer Season 2015.